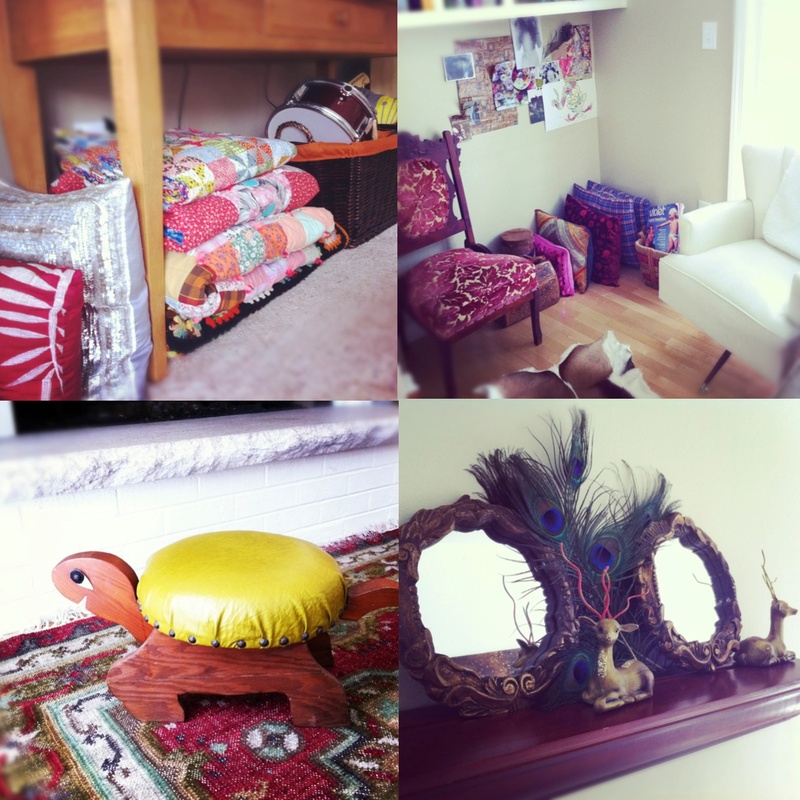 A close up look at bits and pieces of home. Vignettes, if you will. 1. My bathroom wall prettied with Goodwill finds (oh, how I love touches of turquoise) and a J. Crew belt back out for spring (yes, I'm dreaming). 3. A happy yellow elephant (Goodwill) holding our pencils over a hand embroidered gift from my mother-in-law's collectables. Sitting under the palette of paints used for my first oil painting. 4. 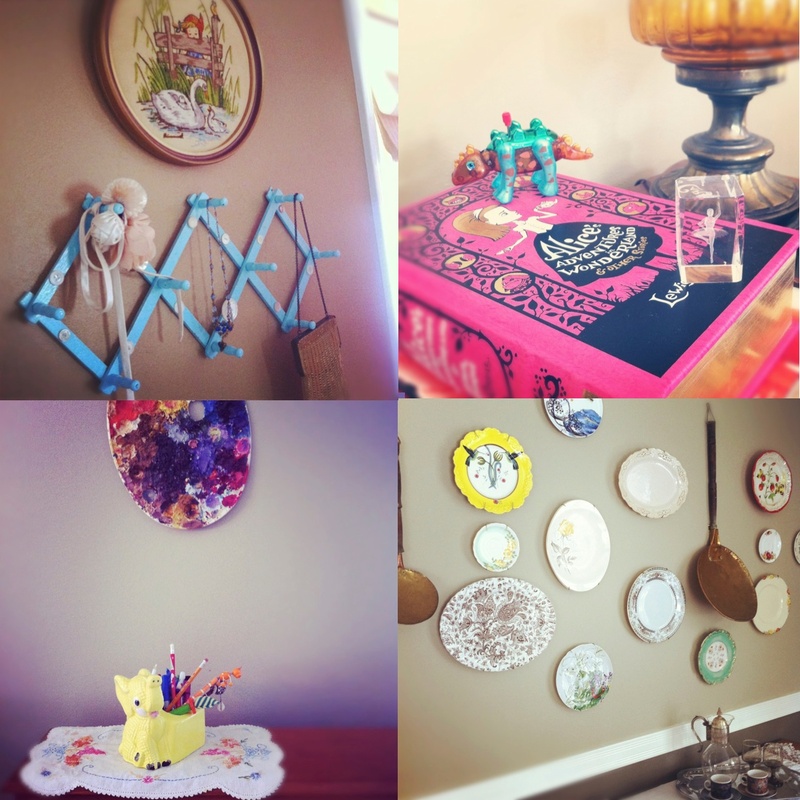 A plate wall - from Anthropologie, Goodwill and an afternoon in Cape Town - with brass spoons from my mom (early 1900's). 1. Gorgeous thrifted quilts from Manna for Life (shhh, let's keep that location our little secret). 2. A corner where pillows congregate for tea and gossip (thrifted chairs). 3. A recent find, this little turtle footstool ($2). 4. Tiny reindeer (Somewhere in Time Antiques) still recuperating from Christmas, not too eager to leave their peacock-y shelf. 1. My mass of boys sharing a couch (not thrifted but ... home made. Haha!). 2. The coat hat rack and the huz caught playing Kinect sports. Is your hat rack from Urban? I have been searching and searching for a great coat rack (we need one desperately) and they are hard to find. I found one I loved at Urban (that resembles yours) but a little too out of my price range currently. Why is a coat rack so hard to find these days? It is actually! I love it but it's not good for heavy coats unfortunately.